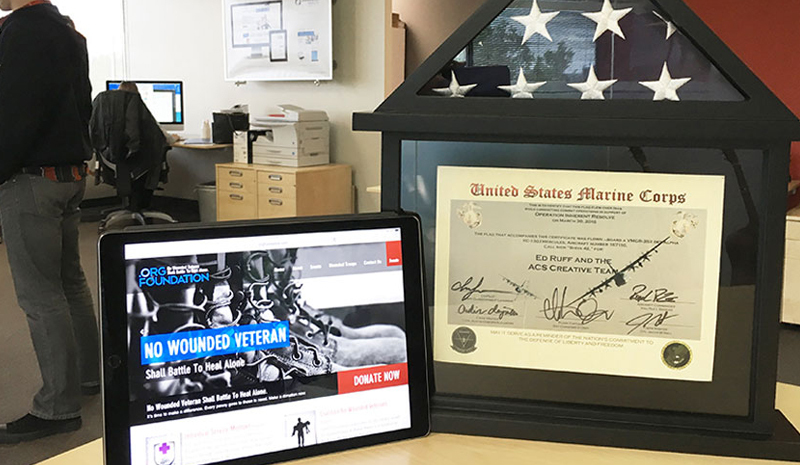 We’ve known U.S. Marine Lieutenants Polycarpe Depe, Emily Eckman and Bethanie Simms since they first decided to set up a charitable organization to support wounded U.S. service members and their families. It’s been our pleasure to create the website for The Org Foundation, and help out in any way we can. We have been privileged to use our talents to benefit those who have served, fought and sacrificed to safeguard our priceless American freedoms. Every one of them deserve our thoughts and prayers. We certainly didn’t expect them to take time to think of us while on active duty! Yet, that’s exactly what they did. And here’s what we received: a commemorative flag that was flown aboard a VMGR-352 Squadron aircraft in Iraq and signed by all the members of the flight crew! We will proudly display this flag in our office. This Memorial Day, we ask all our friends, family, clients and partners to remember the service men and women we have lost … and make a donation to The Org Foundation or the service charity of your choice. Because we owe them a debt that can never be repaid. Thank you Depe, Emily and Bethanie for all you have sacrificed.